We are excited to share the news that the Wake Forest Chamber Foundation, in conjunction with community partners and volunteers has launched the Career Readiness Academy for Wake Forest area students. 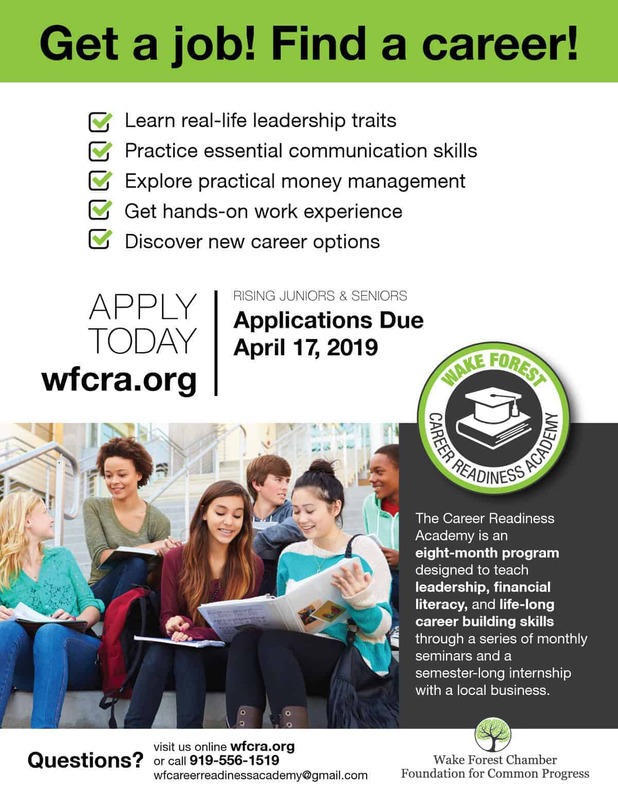 The Career Readiness Academy is designed to offer specific training and internship opportunities to help students in the Wake Forest area become “Career ready”. Between semester-long internship opportunities and leadership courses, students will learn job skills, leadership skills, and financial literacy. As a local Wake Forest business, Redwood Productions is a proud supporter of this initiative. We know that it will not only help students prepare for their future but also help provide “Career ready” students for local Wake Forest businesses. It is a true win-win situation! The Wake Forest Chamber Foundation came to us asking for support and ideas for branding and logo design and we jumped on the chance to help by donating our services and time for a logo and business card. The Career Readiness Academy logo we created has a fresh hip look to attract today’s youth. Check out all the marketing pieces we designed for this program. We have so much to be proud of living in the Wake Forest area. In particular, the great work that both the Wake Forest Chamber and the newly formed Wake Forest Chamber foundation do to support our Wake Forest community. The Wake Forest Chamber Foundation was one of five recipients in the United States to receive a grant from the U.S Chamber of Commerce Foundation to fund this year’s program. The U.S. Chamber of Commerce Foundation wants to create work-based learning programs to better connect students with local job opportunities and potential future careers. There will be no cost to the students selected for the program. For more information and student application requirements click here.